What's a high cholesterol building? One that’s on a fad diet today but will have severe environmental problems in the future. It turns out there’s a loophole in our energy code that allows designers to trade off energy-draining envelopes for better mechanical equipment. 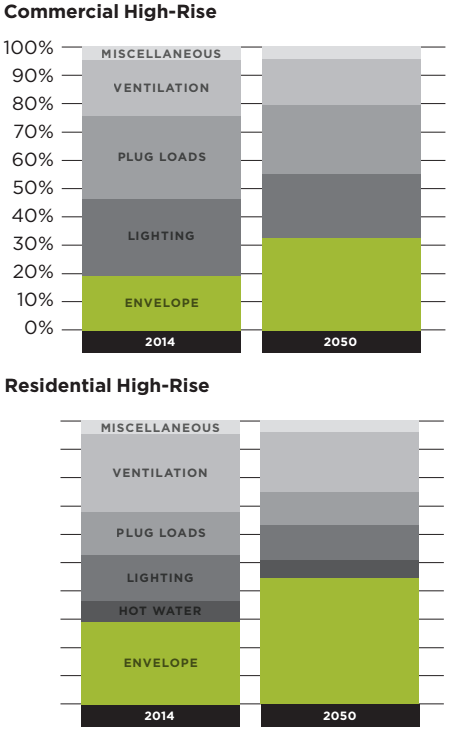 Decades from now, that equipment will be replaced several times over, while the envelope remains inefficient as ever. 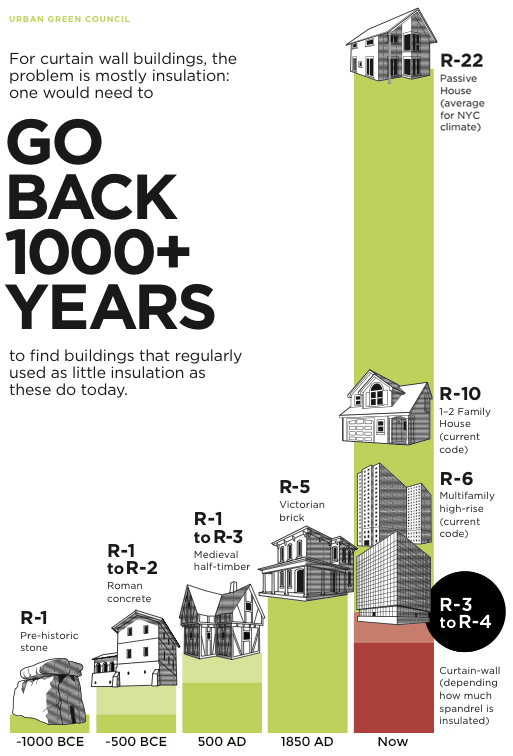 In fact, our report shows that you would have to go back over 1,000 years to find buildings that used as little insulation as today’s all-glass structures. But with better glass, designed views, improved construction training and greener codes, we can have buildings that are as healthy as they are beautiful. Read the report to find out more, and read the Wall Street Journal story here. The Problem Will Get Much Worse Over Time. ENVELOPE: Energy used by heating and cooling systems to offset heat gains and losses through the building’s walls, windows, and roof. LIGHTING: Energy used by lights, as well as the extra cooling needed to remove the extra heat the lights put off. PLUG LOADS: Energy used by computers, appliances, and other plug-in equipment, as well as extra cooling needed to remove waste heat produced by this equipment. VENTILATION:Energy used to deliver fresh air indoors, as well as the energy needed to heat and cool the air to appropriate indoor temperatures. HOT WATER: Energy used for heating water for sinks, showers, and laundry. MISCELLANEOUS: Energy used by elevators, plumbing equipment, exhaust fans, and other items not covered elsewhere. 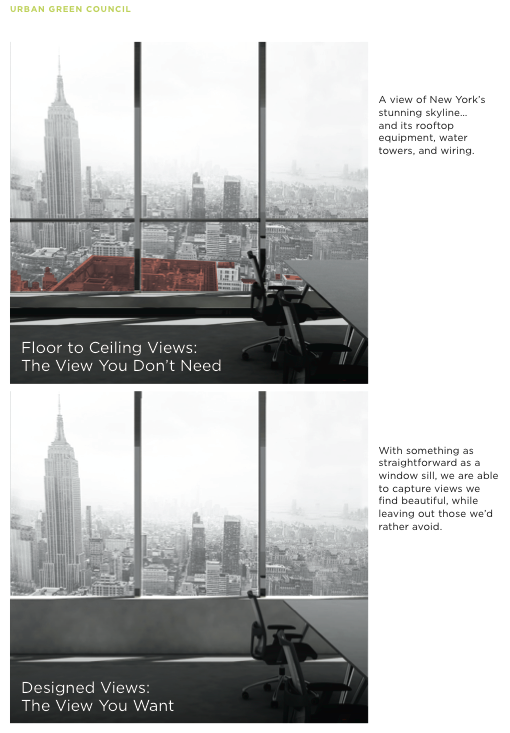 With better glass, improved construction training, greener codes, and designed views (see below) we can have buildings that are as healthy as they are beautiful.